I always have a terrible time remembering to exercise while on the road. I don’t usually stay at hotels with exercise rooms, making it even trickier to work out. If I don’t work out at all, though, I get stiff and sore and start to feel really slothy and yucky after a couple of days. So I’m putting together the Bluepoof RoadTrip Gym. Resistance bands. I got hooked on resistance bands way back when I was in physical therapy for my forearm tendonitis — they’re a great way to work muscles if you’re rehabilitating or, say, don’t have room for dumbbells in your saddlebags. Don’t bother with the ones with handles on them — that just takes up space in your luggage. 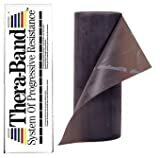 Therabands are just the flat sheets of latex of varying strengths, so they literally take up zero space. The heavier ones are impressively strong, too — loop one over the top of a door and you can get a nice pump going by doing pulldowns. Some brands of resistance bands come with a little workout guide, otherwise a Google search can give you some ideas right away. FitDeck. I ordered one of these after reading about it in Adventure magazine. Is it worth $20? Dunno, but I’m willing to give it a shot. The premise is that the FitDeck contains 52 cards, each showing a different exercise that can be performed with no equipment. There are upper, mid, lower, and full body exercises in the deck. I thought it sounded like a good idea for me since I can never remember anything more exciting than push-ups and sit-ups when I’m sitting around my hotel room at night. The FitDeck is exactly the same size as a deck of playing cards — very portable. I don’t tend to do a lot of cardio on the road, since I often ride until after dark; I’m not about to go jogging alone at night in a strange town. If my hotel’s on the ground floor, I’ll do some jumping jacks and jog in place (I’m kind enough not to do that while on an upper floor 😉 ). Since you all did so well with the “pet peeves” entry, let’s hear your tricks for staying in shape on the road. After any kind of long day in the saddle, I just like to walk. It gets the kinks out of the legs, gets the lungs working a bit better, and lets me loosen up. I may amble a few blocks to dinner, or down to the beach at the campground, or wherever else is convenient. Malls and large hotels are good for this, if available. Stretching also goes along with this. I do quad and glute stretches while on the road (right in the gas station parking lot, usually) to keep my legs limber. A solid full-body set of stretches in the evening goes a long way towards basic comfort. Even though I lift weights regularly while home, I’m generally not too worried about muscle tone on the road, unless I’m gone more than 5 days or so. Then I’ll start doing dips using the furniture in the hotel room, or pullups on playground equipment, or suitcase deadlifts with my hard bags. But the fitness deck and theraband might give me a bit more motivation to keep up with strength training. We’ll see how my road trip buddies handle it. Oh regarding those Therabands… I used em after separating my shoulder. One thing to watch out for is that they degrade over time; all this ozone in our SoCal air appears to eat them. I discovered this after trying to use mine after a couple months and it broke apart when I stretched it. You might want to keep the stock roll in an airtight container or ziplock bag to preserve it. After a day in the saddle the only exercise I like to do is some twelve ounce curls. Beer, it does a body good. Btw, I’m hoping to surprise the Wind Dancers (except Barb, who Knows) by showing up on the Suzuki. And, unrelated, what is your favourite Suzuki shop around here?